Gwyneth Fairchild has been sent by her father, Isaac, to stay with his old friends from America, Winter and Bennet Lane. Never mind that it’s 1814 and England is at war with America, and never mind that she doesn’t want to go. As she is leaving, she is intercepted with a marriage proposal from the handsome Sir Arthur, but when she goes back inside to speak to her father, she unwittingly witnesses his murder at the hands of her Uncle Gates, so she knows she must leave, immediately, before her uncle realises what she has seen.She suffers from dreadful seasickness on the voyage, and doesn’t improve even after arriving at the Baltimore home of Thaddeus Lane, son of Winter and Bennet. But they are determined to care for her, even without knowing why she is so afraid. When they find out, they are even more determined to protect her, especially Thad, who finds himself falling for the beautiful artist. 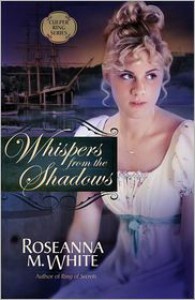 I didn’t enjoy Whispers from the Shadows as much as Ring of Secrets or Fairchild’s Lady (a novella), because the focus was more on the relationship and the suspense around Gates and Sir Arthur, rather than on the activities of the Culper Ring, which were much more a focus of Ring of Secrets. This could be because it was rather slow to get going. Gwyneth sees her father murdered, falls to pieces mentally, and doesn’t really recover until almost the halfway point. Yet Thad falls for her almost immediately, despite the fact that she’s just not herself.And Thad is hiding his own secrets. He’s been married before, but no one talks about it, which seems very strange. We realise why when there is a huge argument at the halfway point, and it’s at this point that Whispers in the Shadows really starts to get going and pile on the suspense. Danger is coming, both from the inevitable war with the British, and from Uncle Gates. The second half of the novel is excellent, as is the unexpected finish, and I was impressed by the historical research and the way the historical events make the war between the North and the South inevitable. Although this is part of a series, it can easily be read as a stand-alone novel—the parts of the story that are confusing in the first half are confusing even to someone who has read the previous books, and the questions are answered in the second half. I will look forward to the next in the series, but I hope it returns to more of a focus on the Culpers, and maintains the pace all the way through. 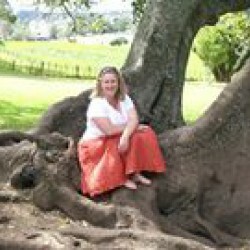 Thanks to Harvest House and NetGalley for providing a free ebook for review.